This is one of our most requested recipes. Simply stated it is phenomenal and can be prepared in a snap. Delicious and easy, a hostess' wish comes true just in time for holiday entertaining. 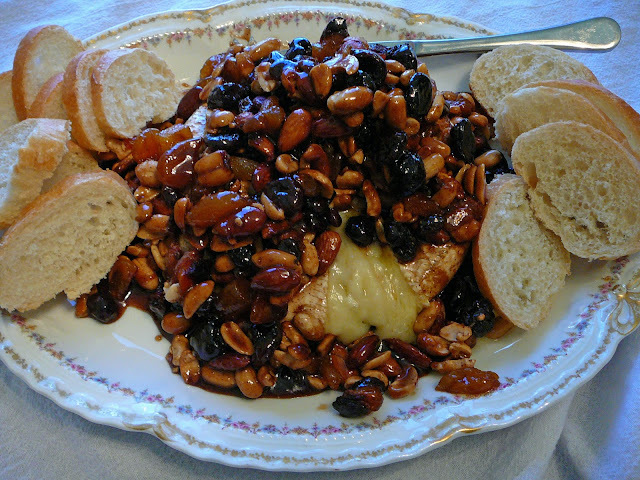 Linda created the cheesy delight back in her Ballard Inn heydays. Any notes of appreciation can be directed her way. And, you'll want to thank her. It's that good. Have you ever noticed that something you thought was delicious many years ago, when tried today can seem rather bland? And you wonder what all the hot fuss was about back in the day? The American palette has changed so much in the last few decades. But not this appetizer, it has withstood the test of time when others have not. The flavors appeal to just about everyone, including children. What I appreciate most about this yummy-ooey-gooey-soft-'n-crunchy appetizer, besides the unforgettable flavor, is that the dish suits every occasion from an informal gathering to the swankiest New Year's Eve party presented with a flourish on fine china. More often than not, I serve the brie on a beautiful ceramic Italian cake plate decorated with falling autumn leaves (thank you Jeff and Sue - a prized Christmas gift from eons ago). Strategically placed nearby is a cloth lined basket filled with sliced French or sourdough bread and in a separate bowl, an assortment of water crackers for good measure. I also put out several knives, so all the people huddled around it can eat with vigor without having to wait to pass a serving implement from one person to another. After the cheese is removed from the oven, it must sit undisturbed for a full twenty minutes. Thereafter, you can serve directly from the pie plate for an informal gathering or transfer (with the aid of two spatulas - one in each hand) to a decorative plate, scraping the straggling remnants of the fruit and nuts attractively on top of the brie. I always cut a small wedge so the warm cheese oozes out invitingly. I have noticed that if a dish is served too perfectly, guests hesitate to be the first ones to serve up a helping. Linda remarked the same applies to merchandising goods in retail land. If a display is too perfect, shoppers don't want to remove items from the still life. We want our guests to eat, and retailers definitely want shoppers to buy, so help the process along by being the first to tuck in. The brie ready to go into the oven. Costco moved into the cheese business a few years ago and although they don't have a wide variety, you can find interesting and delicious cheeses at value prices. I like to buy big hunks of Parmigiano-Reggiano, Manchego, Gruyère, Mexican Queso and Brie, among others. If they only sold Cowgirl Creamery cheeses, my life would be complete (well, maybe... but it would be a nice start). For the mix of nuts and fruit, I have found that cashews, pecans and walnuts work very well. Considering the fruit, I always include apricots, cherries and quartered figs. I also like diced prunes and sometimes I'll throw in some raisins, both regular and golden. Cranberries are a nice tangy foil to the sweet coating. Use what you like best and steer the flavors towards your taste. Make it your own! In addition to sliced baguettes and crackers, Linda advises that thin slices of crisp, tart apples and Fuyu persimmons work well as "delivery agents" for the irresistible combination of warm, soft brie complimented by candied nuts and fruits. 1. Adjust rack to middle of oven and preheat to 350°F. 2. 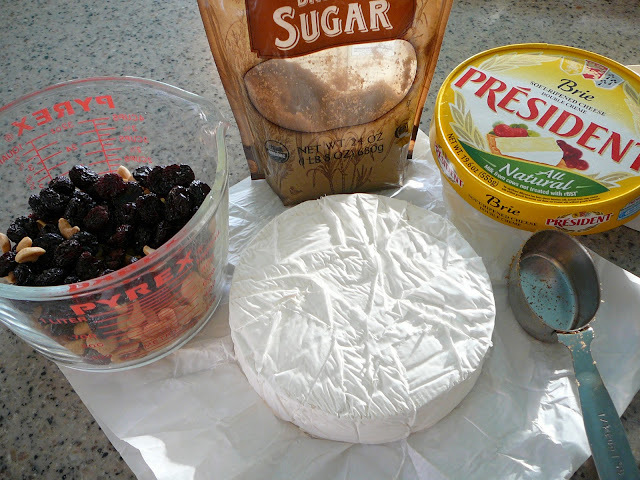 Unwrap and discard paper encasing the whole brie; do not remove edible rind. Lightly mist pie plate with oil spray. 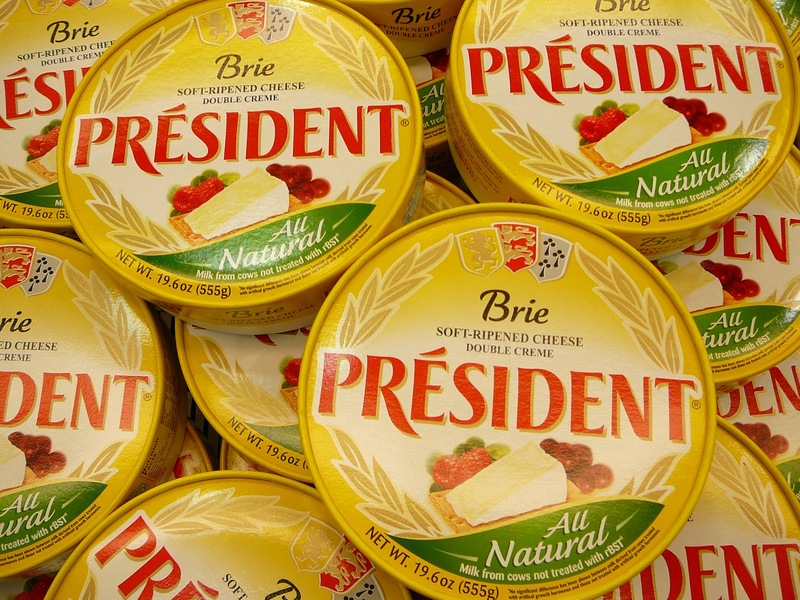 Place brie in pie plate. 3. In a medium saucepan (about 3-quart), bring brown sugar, butter, cinnamon and orange liqueur (Grand Marnier, Bols Triple Sec, or Cointreau) to a boil. Boil for 1-2 minutes to really melt sugar and to make the mixture a glaze. 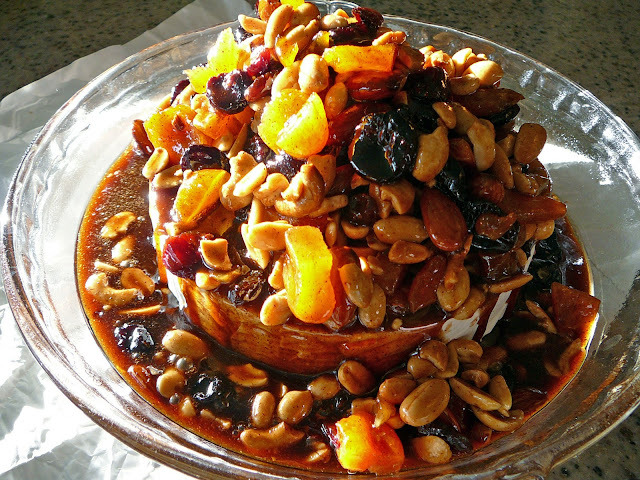 Add nuts and fruits and stir well until glaze is evenly distributed throughout nut and fruit mixture. Quickly scrape the mixture, mounding on top of the brie, and pile high. 4. Bake for 20 minutes. Remove from oven and let sit for 20 minutes before transferring, with the aid of a wide spatula, to a decorative plate or cake stand. Serve with sliced French baguette, assorted crackers and if you like, slices of tart apples and Fuyu persimmons. So, where IS that Zoe, anyway? Well, finally ONE recipe that doesn't float my boat. I do one with the Brie inside puff pastry, with fresh berries soaked in a bit of port INSIDE the puff pastry on top of the Brie to bake. But then, this one is better with bread slices,so I might have to give it a try. Have a great holiday,sistahs. This is a wonderful recipe! I really recommend it.